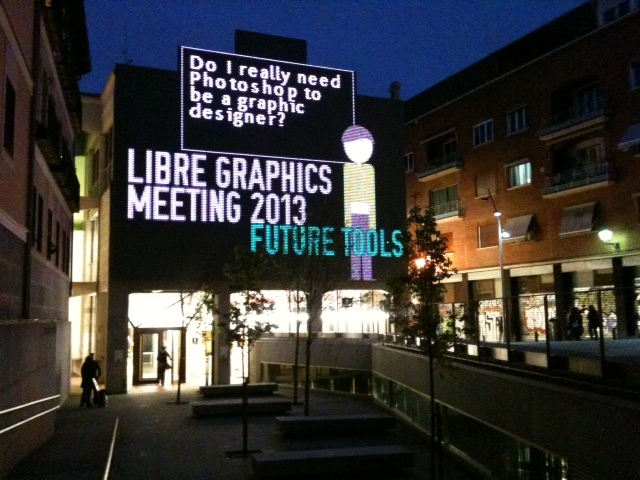 As previously announced, we were present at Libre Graphics 2013 in Madrid last month. This was a really exciting time. 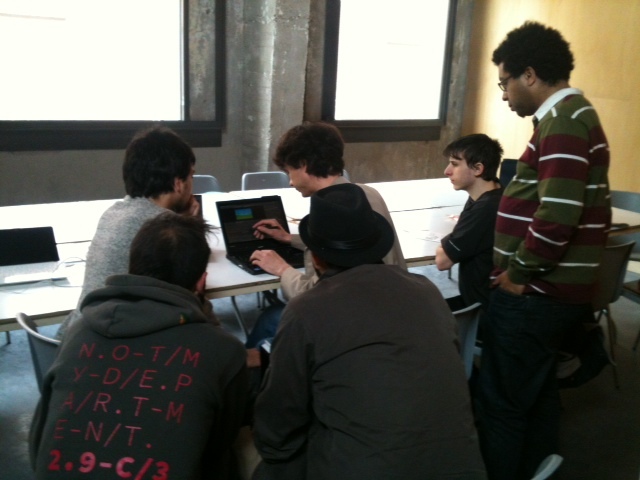 Madrid was awesome, the Medialab-Prado — where the meeting happened — was great, and we met a lot of interesting people and projects. We were lodged in the GIMP team apartment, which sponsored our stay there, as member of the core development team. So this was the first nice thing: finally meet other developers of this great piece of software (elsewhere than in IRC, that is!). As “Studio Girin”, we made a workshop, titled “Libre Media’s creation workflow: sharing session”, not as many people as expected, in particularly as it happened in the same time as the Krita Sketch workshop which had a very heavy marketing this year because of the creation of their foundation, but it still happened well and we had several interesting and interested people in our workshop, which goal was to exchange creative workflows. In particular Konstantin Dmitriev, from the Synfig team and the Morevna project, was eager to share many of his own process. As a conclusion, this went great. 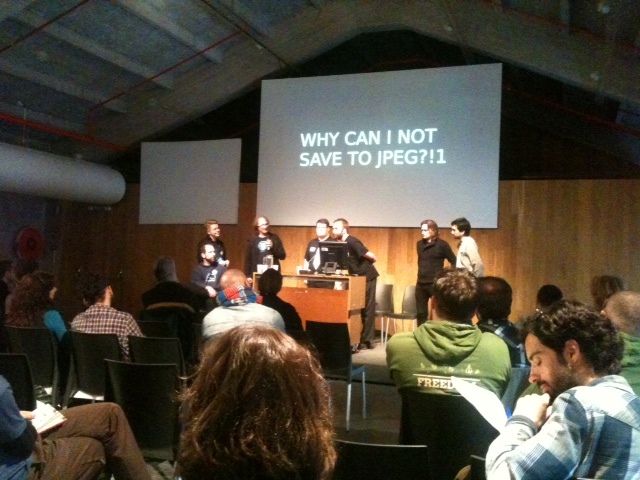 Then the GIMP team organized a Question-Answer session, with a few common “difficult” questions prepared. And as GIMP apparently knows how community marketing works, the project also sponsored the “Friday night party” with free drinks for everyone! Who cares about save/export trolls after that? I often heard of it and never tested it, in particular because we haven’t done vector animation until now (doesn’t mean we won’t do any in the future). So it was very nice to see it in action, in the hand of someone who really knows the software well. And it is definitely powerful, even though the general feeling was still that it was pretty unstable (several crashes during the workshop) and many of the advanced features were apparently hacks rather than core features. Note that this is still great: awesomeness also starts like this. 🙂 And I’ll definitely keep an eye on Synfig. Though I already knew and even did things like these years ago, with an educational background in Artificial Intelligence, that’s always nice to see again Augmented Reality implementations or usage of 3D scanners, especially when they Free Software projects, as this kind of technology is now coming to the “common folks” world. Well I knew this one, like most people who have been around FLOSS for a while. But I never knew it was still that actively developed. They even got a new website. The main feature presented was the recently developed real time collaboration capabilities, allowing to edit a same set of fonts (or even the exact same glyph) in the same time with a team scattered around the world. That was a big stuff. In the better known topic of raster image manipulation, we discovered Krita. I only heard of it but never tested it until now. 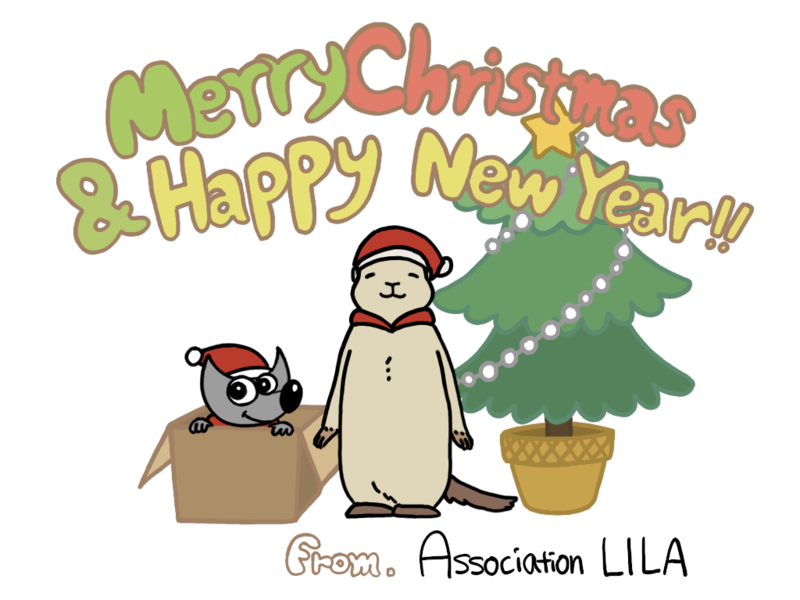 So Aryeom went to the workshop and made a very nice drawing on this interesting software. G’Mic image filters were also interesting, though I already knew about they, especially because they are already available as GIMP 2.8 filters. I sure hope their developers will begin to port all these filters as GEGL (the new GIMP engine) operations for them to be available in GIMP 2.10 as well, when it will be out, and all versions above! Of course we already knew of Nina and her awesome movie, Sita Sings the Blues, but we were happy to meet her for real. We had many questions we wanted to ask her, and so we did. If you still don’t know her work, go see it as soon as possible!